Laura Giambiagi is principal investigator in the International Research Training Group “StRATEGy”. She is a senior researcher from CONICET and head of the Tectonic Group in the Centro Científico y Tecnológico CCT Mendoza. 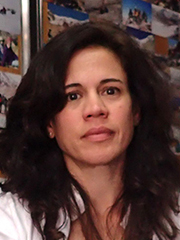 Her research focuses on the structural geology and tectonic evolution of the Andes. Her research aims to understand the mechanisms of interplay between deep and surface processes in the development of the Central Andes, over short (101 - 103) to long (105 - 106) timescales.